The empty chair. The growing pile. Reading is my refuge. Always has been. But recently, reading has come to seem less a pleasure and more a duty. I first noticed it when the cooler, then colder weather sent me indoors. Before the temperatures sort-of plunged, I'd had a mental picture of my over-wintering self. Attired in double-cotton long johns, an ankle-length Navy Blue fleece bathrobe and even fleece socks. Engrossed in something printed, sitting by the window in my mother's 1920s wing chair. 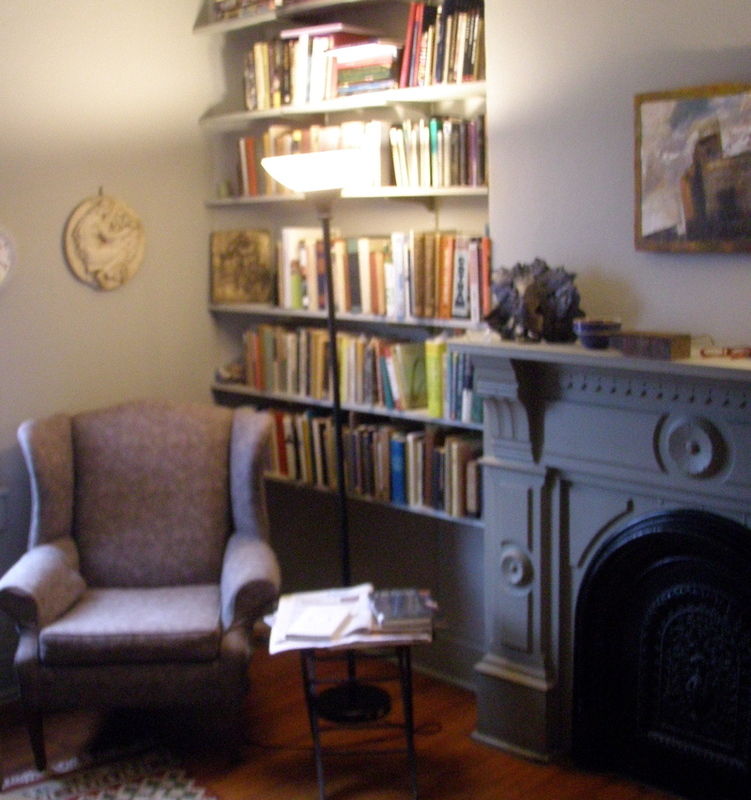 Next to the chair on a rickety folding table, a periodical or two, a book or two or three. A bibliophile's fondest image. But that's not how it's turned out. Because when I'm in my office, I'm generally where I am now, seated in front of a flat-screen monitor, writing, or more to the point of this entry, reading. Meanwhile, the unread stack of words impressed onto sheets of paper piles higher. In my studio. In the kitchen. In the living room. The tactile-ness of paper pages, the heft of a hardbound volume can disappear with the lick of a flame, almost as fast as when I click the 'Delete' key to dispose of an unwanted page. And yet the unread book or article has a nagging importance to me that unopened e-mail messages and online so-called subscriptions just don't. Lured by intriguing subject lines or cleverly titled links, though, I can spend hours chasing text online and, guilty though I am about it, do my best to ignore the stacks of words on paper piling up elsewhere around the house. But I'm fighting back by reclaiming time to read. --By discontinuing subscriptions I consider optional, like The New Yorker, most of which I skim. Sure I like the cartoons, but not at these prices. In 30 days or so the crocuses will be up and I'll be kvetching about crosswalks and catch-basins. Can't wait.